Beer drinkers have it made when it comes to keeping their drinks cool. Coozies for bottles and cans are plentiful, and perfectly suited for keeping ice-cold beer, near ice-cold. Wine drinkers, in contrast, do not have it so easy. Using a wine glass for a drinking vessel may be the proper way to enjoy a glass of nice, crisp white wine, but they don’t do a great job of keeping wine cold—despite the stem. (Not to mention filling an ice chest with glassware isn’t such a good idea.) Despite all the forces of nature conspiring against wine drinkers, there is help on the way. 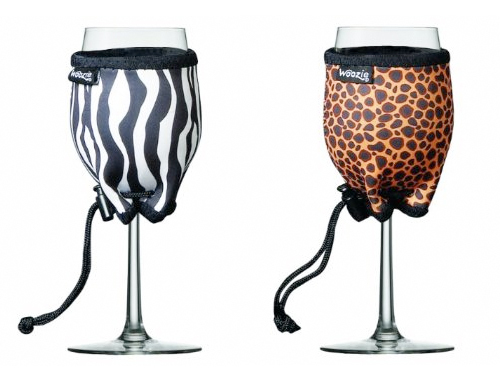 The Oenophilia Woozie Neoprene Wine Glass Sleeve Safari Collection Party Pack keeps wine glasses cool despite the temperature outside. Packaged as a set of four, the bright and fun material stretches around wine glasses, saving wine drinkers from the need to precariously balance their glasses by holding on to the stems. Which of course, becomes a less reasonable way to hold a wine glass as the evening goes on. Also available in a Caribbean Collection .